I liked the first Tales of a Sixth Grade Muppet so much that I had my mom take me back to the library to get the next three! 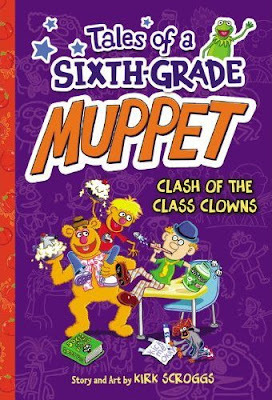 Tales of a Sixth Grade Muppet: Clash of the Class Clowns is about a boy named Danvers who turns into a muppet when he sees a green flash and smells burnt apples and pistachios. One day, when he is at school, they get a new student who is making unfriendly jokes about Danvers and his friends. Danvers decides to challenge the new student to a comedy competition. Danvers now has to start his journey into the world of jokes with the help of Fozzie Bear, Pepe, Dr. Bob, Statler, and Waldorf! I really liked this book because Danvers once again is having problems with his new life as a muppet, but he's also really enjoying it. I also like this book because it was really funny, especially since the book featured a joke-off. Check out my review of the first Tales of a Sixth Grade Muppet book.